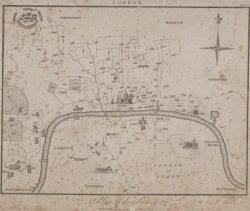 This plan for a survey of London was published in Volume XIII of 'Encyclopaedia Londinensis' in 1814. The plan's title appears above the plan, with a compass star at the top right. St Paul's Cathedral and other prominent buildings are shown pictorially, with other places of interest indicated by numbers.